Home/Roger Federer/Who is the Most Popular Tennis Player on the Planet? 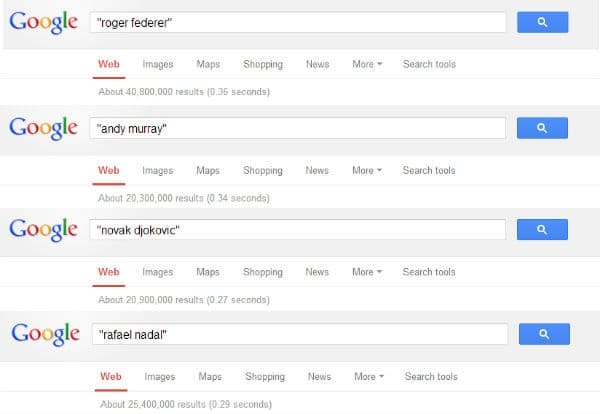 Who is the Most Popular Tennis Player on the Planet? The debate of who is the greatest player of all time crops up at regular intervals, usually when Federer has won a title to boost his credentials, or lost a key match that makes some question whether he truly is the GOAT. But forget the debate of the greatest player, what I want to know is who is the most popular tennis player on the planet? Without conducting the biggest worldwide survey of it's kind ever, the only data and information I have to go on comes from Google, Social Media and the general online tennis world so that's what I'm using to find the answer. The more searches, mentions, tweets, Facebook fans, articles about them a player has indicates the more popular they are. I.e. negative press, hate isn't factored. I'm using the players full names to avoid nicknames ruining the data. Bill Murray is still quite popular! 5 rounds, each covering a different metric, the player who wins the most rounds will be crowned the peRFect Tennis Most Popular Player on the Planet and receive a cheque for £10 + a bottle of Lambrini. Round 1: Which Player has had the most “web search interest” over time? This chart uses the power of Google and looks at the interest in the current top 4 players over the time. Interest is defined as how many times a player is typed into the search box. The numbers on the graph reflect how many searches have been done for a particular term in this case the players name, relative to the total number of searches done on Google over time. The data is both scaled and normalised. On average, since 2004 Roger Federer has had the highest amount of interest. No player has had a higher ‘peak' of interest than Roger Federer with his high points coming in 2009 winning the French Open and in 2012 where he won a 7th Wimbledon against Murray. The player with the least interest is Novak Djokovic. Round 2: Which player has the most content written about them? You may have noticed that whenever you type something in Google just above the search listing it tells you approximately how many results are indexed for that query. Basically, that's how many pieces of content written about a particular subject there are. In this case Roger has almost double the rest of the top 4. Of course it's not 100% accurate and there's nothing scientific behind my test, Roger started his career before the other 3 players so he clearly has a head start but based on those figures alone Roger is written about on average twice as much as everyone else. Round 3: Who has the most Facebook ‘Likes'? I'm unsure which player started their Facebook page first but I do seem to remember that for a period of time Nadal overtook Roger in the number of likes. It's still neck and neck but with Roger pulling clear by 500,000 is it a sign his popularity is increasing even in the twilight of his career? Round 4: Who gets Tweeted about the most? Unfortunately I only have access to data from the last 365 days so this round somewhat depends on the season the player has had. Murray streaks ahead due to losing the Wimbledon final and then winning the Olympics and the US Open giving him a great three months over the summer. Nadal is way off the pace but his injury put him out of the spotlight after the French Open. Yet again Novak is bottom of the pack. Round 5: Who get's searched the most in Google? That data above show often people across the globe searched for each player. The numbers quoted are the average number of searches over 12 months for each player in all locations, languages and devices e.g. mobile, tablet, laptop etc. I thought after Murray won the Twitter round above he'd be close to the top here as it's only data from the last 12 months but as you can see he only get's searched half as much as Federer. So there you have it, Roger wins 4 of the 5 rounds and is rightfully crowned the most popular player on the planet. It's the result I expected but it was interesting to see some numbers behind it. The biggest surprise for me was that Djokovic doesn't appear to have a big fan base. It's still early in his career but with his home country Serbia not having a huge population how can he spread his fan base world wide like Roger has managed to do despite Switzerland also being relatively small. It also begs the question, who will be the next biggest player on the planet? Will someone in the top 4 overtake Roger or does it need a new player to burst onto the scene and win a couple of slams back to back to get everyone talking? One thing's for sure it's going to take something extraordinary to get close to Roger in terms of worldwide appeal and raw number of fans. Man, thats one hell of a research you’ve done.. Great work as always..! 🙂 Thanks a lot !!!! i think the facebook likes should take into consideration the fact that spain has a population of almost 50 million while switzerland has only 8 million people. im sure that if switzerland had 50 million people as well, roger would have had much more likes than nadal. Yeah good point! Also South America has strong Spanish ties so I guess that will help. Be interesting to see who would have the most twitter followers if Fed used it. Hah! Surprise, surprise. But hey great work, Jonathan. I wonder who is No.5 or maybe somebody might be more popular than Djokovic or Murray…Delpo by any chance? Haha I know, a somewhat expected result! Good point about who comes next. I guess it logically will be Del Potro or Ferrer but could be someone else. It’s a shame America has no stars as they’d be up there right at the top no doubt. Yeah I guess Nadal’s injury played a part. The first round though is since 2004 and Roger has averaged higher all the way. Roger is the most beloved and popular tennis player all over the world, go Roger!!! Good stuff. I always thought Roger is the most popular anyway. Nice to have data to back it up. About the Spanish ties to South America, not sure there is much love between Latinos and Spain. Yeah me too, I just thought I’d see if it held up in terms of online popularity! Roger is not only the most popular tennis player in the world, but he’s probably in the top five in terms of most popular athletes worldwide. And he was #2 in the most influential list, behind only Nelson Mandela. Nobody even comes close to him in tennis though, definitely. Very interesting and unusual statistics. Roger is a winner even in these unusual criteria. Thanks for your efforts and post Jonathan! But I think everyone who commented on this page, gives priority to Roger’s perfectly GAME! Me too! Regards! I think number of tweets, monthly searches in Google is a pretty cool way to measure popularity! I did a few searches for lower players, Grigor Dimitrov gets close to none! Not specifically related to this topic, but I have one complaint on the Roger’s official website. Is not particularly attractive, and should work on the design. What do you think? As for example, in my opinion Djokovic web site is VERY GOOD! I did not watch the other players. Yeah Fed’s website looks a little dated I agree. But I don’t mind the overall design. It has a lot of good information on there which is probably the best thing about it. Not a fan of Djokovic’s really, it looks modern but nothing makes me go wow when I see it, just alright…. Yes of course, information on web site is crucial part, but I like perfection in all aspects. I think it’s just a marketing thing that Roger does not need to worry about when you see how many fans he has! 🙂 Web site is less important, just wondering if anyone else noticed?! Regards! Wow, very cool graphs! (I’m a math teacher and love the number crunching!) And the results were not too surprising. But what we also have to consider is that popularity takes into consideration factors beyond a person’s occupation. Roger has a certain subtle charisma and “llikeability” (is that a word?) that others lack and maybe that’s your point here. I know some feel about Nadal the same as a lot of people do about Roger but I don’t think that Djokovic, even over time will ever have the same kind of attraction. Just my opinion. Anyway, thanks for the entertaining research. Your blog is amazing – you definitely have a gift! Yeah I think Roger is probably the most genuine guy on tour. At least the most genuine one of the top players anyway that we see interviewed and in front of the cameras all the time that’s for sure. Nadal and Djoker don’t come close in my mind. Novak is funny now and again but I still think he has a darker side to him. Nadal is just Nadal, he’s in the sport to win, nothing else. Which is fair enough, but his team try to get him to lay it on thick in front of the cameras and it just doesn’t work. Hi Jonathan I agree about Novak This nationalism thing goes a bit far and creeps me out. Also the time he ripped off his shirt -give me a break! To be fair he gives credit to an opponents good shots which Murray never does. Roger doesn’t react at all generally. I’ll never be a fan of Murray’s until he can grow up and get some class. I sure am going to miss Kim cljisters. After federer she was my favorite to watch. Women’s tennis is going to be boring for awhile. I wish Henin and Graf would come back. I’ll bet Steffie could still give the current women a run for the money. Never been a huge fan of WTA but Graf probably my favourite player she was good to watch. And you could describe her as feminine. Which is becoming harder and harder in womens tennis. Another interesting fact. The highest ranked North American player is Raonic, a Canadian. With all the tennis academies in the States, makes you wonder. Ah yeah I might have a look at him, if he wins some tournaments next year then I think his popularity will go up. Especially if he can win a hard court tournament in the US. 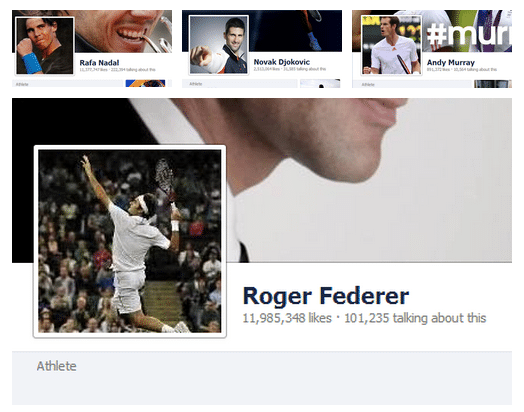 Hey Jonathan, Roger has 12,034,715 facebook likes now! Must be South American affect. Loved the idea the fans can watch tour matches on his own Youtube cannel. It would be really neat for Fed’s channel to livestream all his matches but it won’t happen. Yeah free viewing for all, that’d be cool! Too many TV broadcasters involved who pay money for it who’d kick off. Whoa, that shot up! Not sure I’m going to keep updating my post to make sure it’s accurate, be a never ending job! What’s really remarkable is the fact that after winning his first grandslam title in 2003, Roger already accumulated such a huge fan base and from there, there was no turning back! I mean Djokovic and Murray are in their peak now but they can’t still manage to rake in fans the way Roger did after that Wimbledon 2003! ATP FAN FAVOURITE since 2003, my gosh that’s really some manifestation when it comes to fan base! Yeah I never thought of that. I guess Wimbledon is the best slam to win in terms of generating fans, the most prestigious one and he had kinda got on the radar beating Sampras 2 years before. Don’t think there will be another like him. Not in this lifetime anyway. I think for nowadays roger is not as popular as several times ago, now rafael is very popular. And honestly, i’m more interested with rafa’s aggressive game than roger. I don’t think so, still the biggest draw in tennis by a country mile. Aggression doesn’t work everytime. Somewhere it is important to be humble and nice. And afterall watching Rafa’s game for the last one year i really don’t think that he has some glory left in his so called “AGGRESSIVE” GAME!! How do you factor in Twitter followers? : Roger 6.23 million. Rafa 11.6 million (grew over a million this year). Selective stats can always prove what you want but based on Google alone stats mean little. 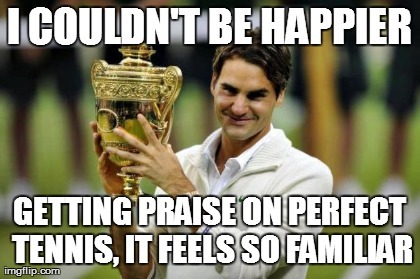 Roger probably is the most popular player but it’s far from fact. There are always other factors such as Serbia being a poorer country – internet affordability became a major thing in 2010! You also have to consider the age of the fans particular players appeal to – younger fans are more likely to use different aspects of social media and download rather than endlessly searching for news. Also, fans switch off when players are not doing well or injured, not because they have gone off them but they don’t want to read bad news or, of course, when news is limited (as is the case with Roger and Rafa now) – people are reading more about Andy Murray at the moment, simply because he is in the news. Also, dare I say that if Roger has more written about him it may be because he appeals more to the largely middle class journalistic world.